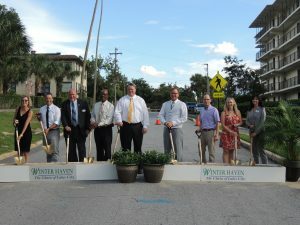 Stambaugh & Chilton Recognized at Seventh Street Groundbreaking - Sharit, Bunn & Chilton, P.A. Sharit, Bunn & Chilton, P.A. On July 9, 2018, the City of Winter Haven held a groundbreaking ceremony celebrating the start of the much-anticipated Seventh Street Roadway Improvement Project. The efforts of attorneys Bob Stambaugh and Robert Chilton were recognized by Winter Haven Mayor Brad Dantzler, M.J. Carnevale, the city’s Director of Public Works, and Katie Worthington, President and CEO of the Greater Winter Haven Chamber of Commerce. The project consists of vital roadway improvements in Winter Haven’s Downtown Oaks neighborhood along the Seventh Street corridor between North Lake Howard Drive and Avenue G SW.